Elsewhere in Europe, consumers have had the opportunity to purchase locally-sourced food and drink from farmers’ markets for many years. But in the Czech Republic, the concept of buying sausages, cheese or vegetables directly from the farmer rather than from a shop or supermarket took off only very recently; the first market was held on 20 March 2010 in Dejvice, Prague 6. Around 15,000 people visited the market, highlighting the great demand in the capital for a farmers’ market. Fortunately, by the time I moved to Prague in the summer of 2011, I had a variety of markets in Prague from which to choose. 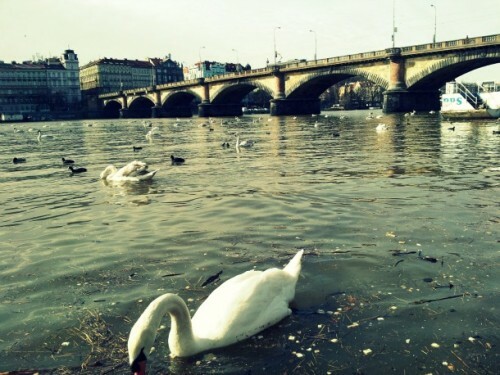 My go-to farmers’ market (or farmářský trh), however, is Náplavka, situated along a picturesque stretch of the Vltava riverbank. It’s the most central market in the city and it makes for a delightful weekend outing. Náplavka recently opened again for the 2012 season, so I stopped by on Saturday to stock up on goodies for my kitchen and take in some much-needed sun. After a cold and dark Prague winter, the sun returns! 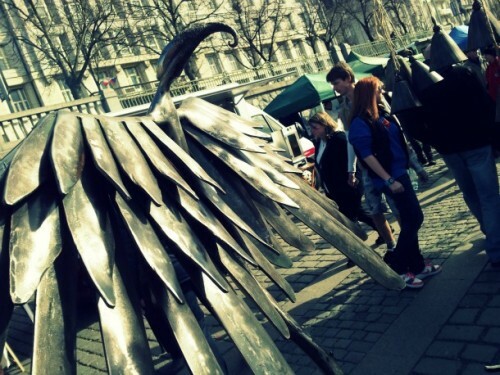 The Náplavka market features both food and handmade goods from local artisans. Depending on the season, you can find fresh fruits and vegetables, juice, dairy products, plants, herbs, bread, pastries, meat, and fish. Artists sell stained glass, ceramics, and metalwork. There are also pop-up restaurants serving everything from Balkan food to hearty soups. The farmers’ market is a great place to find classic Czech treats like pickled fish, wine, and medovina, or mead. Hefaistos is a collective of blacksmiths who create otherwordly metal sculptures, jewelry, and utensils. They do metalworking demonstrations (the old-fashioned way, with an anvil) at their booth. It took blacksmith Vitek three weeks to create this metal sculpture. 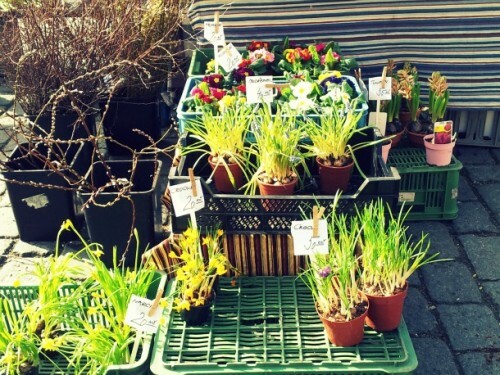 You can also find seasonal flowers and plants at the market. Czech winters are notoriously gloomy, so it was a delight to see these brightly-colored flowers–a reminder that spring is just around the corner. 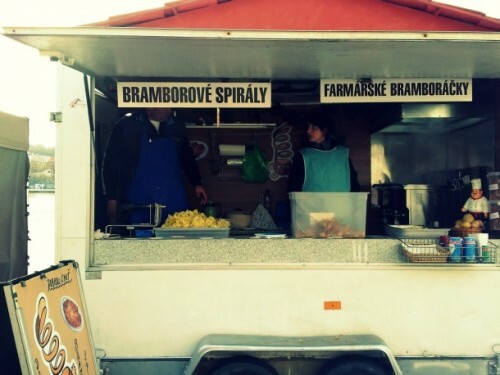 Bramborové spiraly is Czech for “spiral potatoes.” These potatoes are spiral-cut with a drill, deep fried, and then served in a paper cone. Probably not the healthiest snack in the world, but undoubtedly delicious. Davídkovo Koření sells spices and herb mixtures made without salt or gluten. I started eating gluten-free last fall, so this was a nice surprise. Their blends smell amazing and come with food pairing recommendations. 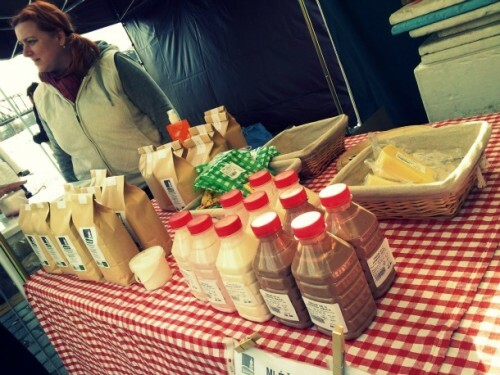 BioVavřinec sells organic dairy products, including milk, butter, and cheeses. I was lucky enough to nab their last 1000g tub of yogurt. 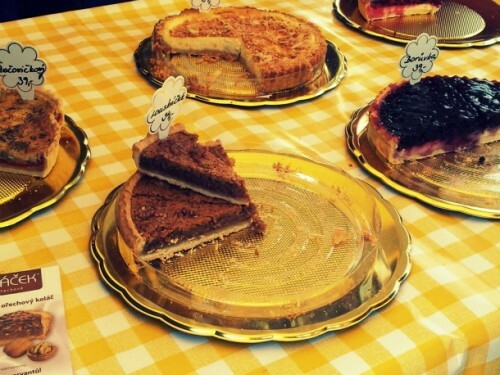 And of course, the desserts: all-natural, preservative-free pies and traditional Czech pastries, to name a few. It's no surprise that these cakes didn't last long. 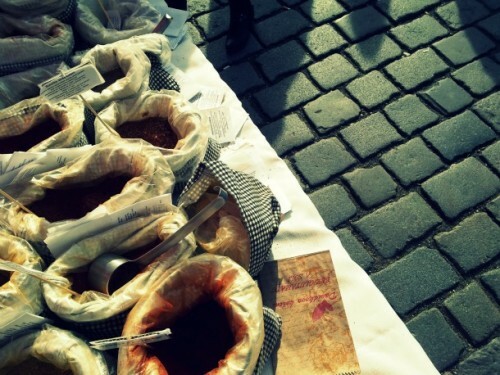 I’m looking forward to another delicious season of farmers’ markets in Prague! This entry was posted in Do, Prague, Taste and tagged camilla, czech republic, do, Farmářský trh, farmers' market, naplavka, organic, prague, taste, vltava. That looks like an awesome market! Do you find that with more access to farmers, more Czechs are aware of/having their shopping habits influenced by food miles? Despite having a farmer’s market in my home town for example, very few people make the trek, and still prefer the all-seasons-all-the-time grocery stores, whereas clearly in Berkeley, people spend a lot more time doing their weekly shopping at the markets. What’s your impression for how the people of Prague shop? And is it a weekly task or a multiple times a week event? I don’t want to generalize, but I think that supermarket culture is still quite strong here. A couple of young Czech filmmakers actually made a very clever documentary about this (http://en.wikipedia.org/wiki/Czech_Dream). I think that it may have something to do with the legacy of communism and the neoliberal, consumerist cultural backlash that happens when all of a sudden people have access to all the food and products they want, without shortages and quotas and long lines. Still, this is changing–as evidenced by the growth of farmers’ markets and organic/health food stores. That’s something I hadn’t thought of at all – thanks for the insight! I’ll have to check out that film. Spices and herb mixtures made without salt or gluten sounds amazing! I once visited Prague in Christmas and loved it but these pictures make me wonder how beautiful it must also be in spring and summer!